Purple sea feathers are one of many color variants in the genus Pseudopterogorgia sp. They are most common on inshore hard bottom habitats that either gets a lot of wave action or a lot of tidal currents. The picture shows the polyps extended, giving it a fuzzy yellow appearance. 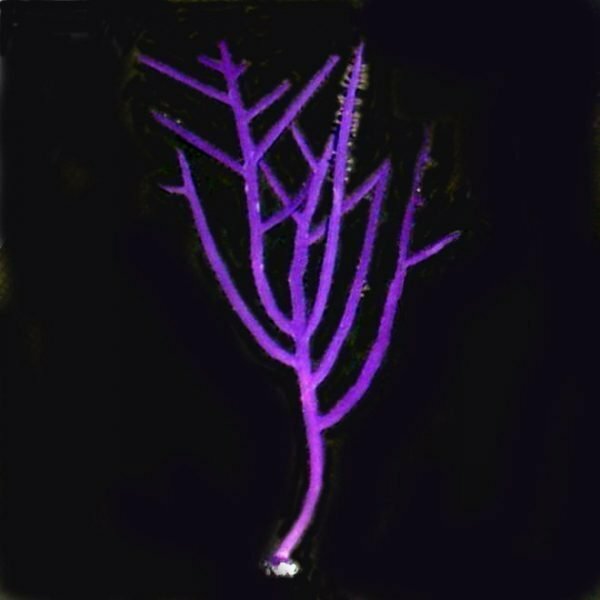 This is a very hardy species of gorgonian and will thrive in almost any tank and would be a good beginner gorgonian for someone wanting to try their hand at keeping soft corals. There are several other color variants that we regularly stock and all of them are equally hardy and will get along well with each other. This gorgonian like currents, so keep that in mind when placing them in your tank. All of the gorgonians we sell have been kept successfully for many years in all kinds of reef aquariums and have passed the “test” for being suitable for marine aquaria. They are hardy, attractive, easy to care for, and will feed on must types of foods designed for plankton feeders. Because most of them are photosynthetic, they will derive much of their nutritional needs from the lighting in your aquarium, so they don’t require large amounts of supplemental food. Also, all of our gorgonians will have some sort of base to them, which you can mount onto a rock with super glue or epoxy. I prefer to use epoxy because it is less likely to fall off after a few months, but gel super glue works too. Most gorgonians can be safely pruned if they get too big, and the cuttings will grow and survive if mounted on something stable.